Old Street Roundabout is a roundabout located on the boundary of the London Borough of Hackney and the London Borough of Islington. 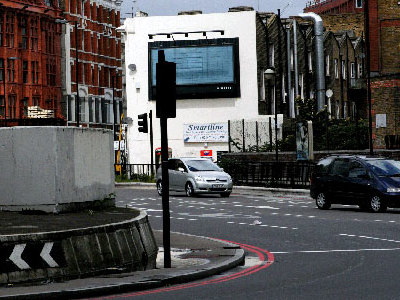 It is an interchange system at the junction of Old Street and City Road. 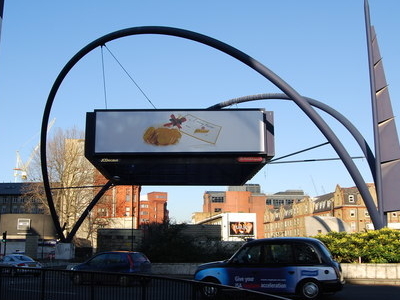 It is sometimes known as St. Agnes Well after the shopping centre beneath it, while the area surrounding the roundabout is often colloquially known as Silicon Roundabout, owing to the prominence of British web-based companies there. City Road crosses the roundabout, running south towards the City of London and Moorgate and Liverpool Street stations, and north-west towards Angel, King's Cross, St. Pancras and Euston. The roundabout, the north-western part of City Road, and Great Eastern Street form the boundary of the London congestion charge zone (CCZ). To the west of Old Street are Clerkenwell, Bloomsbury, and the West End. To the east are Shoreditch and London's East End. The shopping complex in the underpass at the centre of the roundabout is named St. Agnes Well, after an ancient well thought to have been located about 200 metres to the east, at the junction of Old Street and Great Eastern Street. Old Street station is located below Old Street Roundabout. It is served by the Bank branch of the London Underground Northern line and by First Capital Connect trains. Here's the our members favorite photos of "Plazas and Squares near London Borough of Hackney". 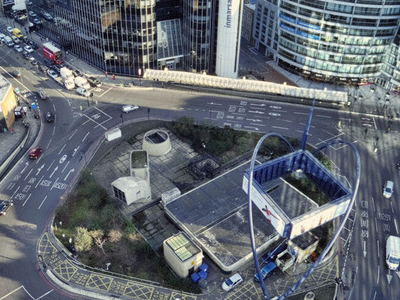 Upload your photo of Old Street Roundabout!